Here is some information on decal placement for 1968 Shelbys. I tried to find pictures of original parts to use as a resource. Placement sometimes varies from car to car, but this should be a good starting point for your own research. Some of these decals were paper and it is difficult to find original examples. Let's start in the engine bay. The entire master cylinder and brake booster were painted black at the factory. This includes the master cylinder cap. On the cover of the master cylinder there is a silver foil and red printed decal. This decal is the original from # 1628. The decal reads " CAUTION USE ONLY ESA M6C25-A BRAKE FLUID "
This is the service specification decal. It is found on every car. This silver and black decal is sometimes turned sideways. The orientation varies, but they always seem to be on the front of the left hand shock tower, behind the washer bottle. Many cars also have a emission control decal. That decal is usually placed directly above the service spec decal. I have seen many cars with smog that do not have the emission decal. The same decal was used for the GT350 and GT500/GT500 KRs. If you look closely, the decal states, "Shelby Automotive Inc. certifies..." You can also see the remains of the part number in the lower, right corner. This is an original decal. 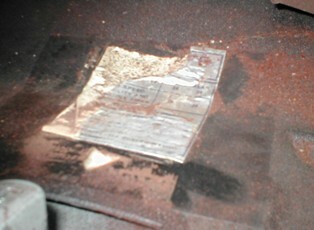 The battery inspection decal is placed above the battery on the right, front fender apron. This decal is made of paper. It is very hard to find good examples of these original decals. I do not believe that any 1968 Shelbys used a "CAUTION FAN" decal. 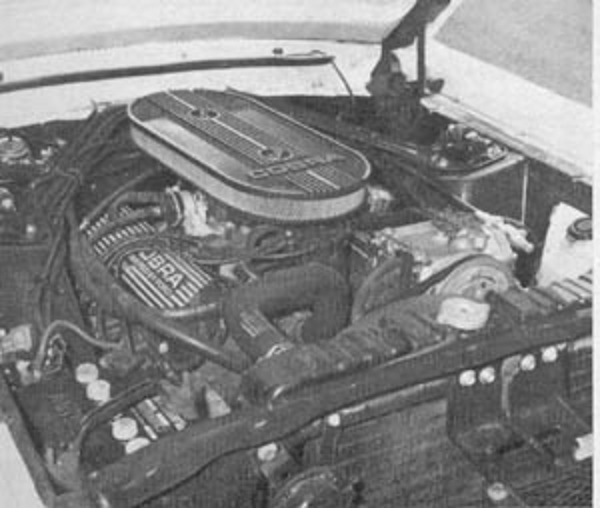 This pictures shows a GT350 used in an early road test. There is no decal. 1968 GT500 KRs used only one decal on the air cleaner. This decal was probably paper and is on the side of the base. It specifies the correct air filter. The engineering number on this decal will match the build sheet. GT500 KRs do not have a decal on the air cleaner lid. When you look in the glovebox you should see a decal. It is the tire pressure decal. 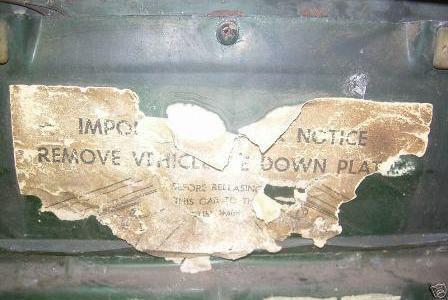 This is an original tire pressure decal removed the glovebox liner of a 1968 Shelby. The correct tire pressure for the E70x 15 tires is 28 PSI. 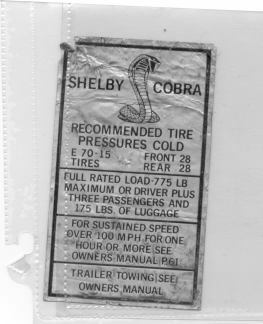 You will probably find a Mustang tire pressure decal underneath the Shelby tire pressure decal. No attempt was made to remove it, because the Shelby decal was larger and could cover it completely. This picture shows the Mustang decal after I pulled the Shelby decal up. Each of the sunvisors has a seat belt decal. This decal is gold with black print. I have found this decal on convertibles and fastbacks. 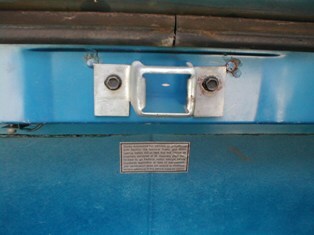 On the driver's side latch for the convertible top Ford placed an inspection decal. This decal is paper. It was hand signed and dated. There are two decals on the bottom of the trunk lid. 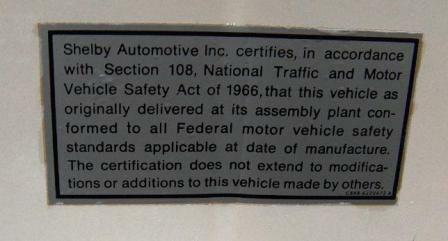 The first is the Shelby Certification label. This decal informs everyone that the vehicle conforms to the current safety standards. Interestingly, the decal calls the company "Shelby Automotive", even before the company name change. Here is a close up of the decal, notice the small part number. Judges may also look at word spacing to identify an original decal. 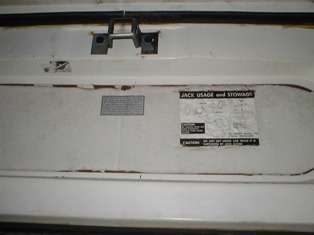 The second decal is the jacking instruction decal. This decal shows the proper method of jacking the vehicle. Remember, all 1968 Shelbys used a full sized spare, so the decal will look like the original above. There were no space saver tires. 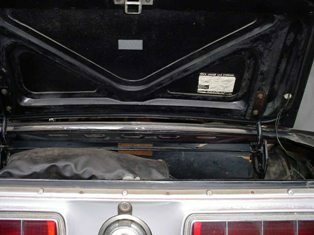 This picture shows typical placement on a convertible decklid. 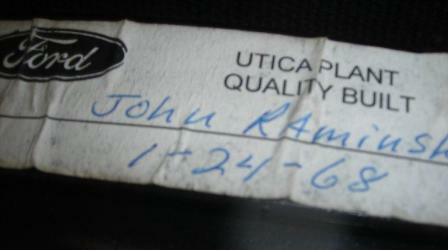 Here is an original fastback decklid. That is original paint ! 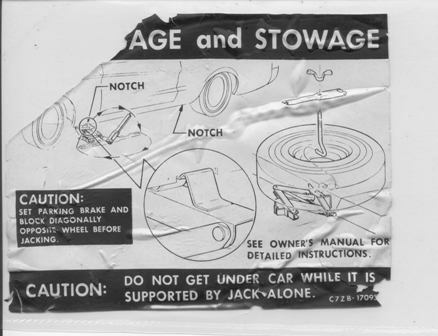 The scissors jack also has a small decal directing people to the instructions. This decal is paper. It is hiding behind the liscense plate. 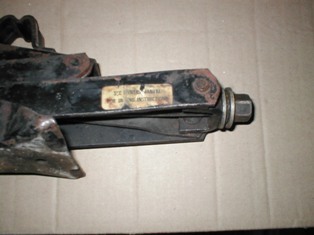 It instructs dealers to remove the shipping tie downs. I will update this page if I missed an important decals. There are several smaller decals and labels on wiring harnesses, but we will skip those for now.